Las Vegas, NV (October 3, 2017) – Morse Watchmans has expanded its portfolio of key and asset control products and technologies with the newly available RFID-based AssetWatcher System. Featured this week at G2E, AssetWatcher’s RFID technology uses non-contact wireless radio links to recognize and track tagged assets placed in or removed from lockers. It is compatible with multiple types of RFID tags as well as different types of assets, and features an audible confirmation when a tag has been read. AssetWatcher can track multiple items within a locker and can track all types of tagged assets, including electronics and metal objects. Featuring the same reliable and easy-to-use interface as the company’s popular KeyWatcher® Touch, AssetWatcher includes a bright 7” touchscreen and incorporates the state-of-the-art optical fingerprint reader to ensure only authorized users have access to specific assets. Operating modes allow AssetWatcher to accommodate a wide variety of uses. In Standard Mode, users are assigned permissions for access to assets or groups of assets such as commonly used radio equipment. In Classic Mode managers can also specify that assets can be returned either to any open locker or assigned to a specific locker. Leased Mode allows users to “lease” a locker temporarily and is ideal for occasional use or use by visitors. If a user has no assets in the system at the time of sign-in, AssetWatcher assigns them a locker to store their assets, whether or not they are RFID tagged. Once the user removes his or her assets, the locker is deemed to be “free”, and can be assigned to someone else. On-demand enrollment allows users to sign up for a locker using the optional fingerprint reader or access card - ideal for environments with high numbers of temporary users. In contrast, Owner Mode assigns each specific locker to one or more individuals to accommodate shared or specific assets such as valuable repair/maintenance tools that may be used by one person or a specific group of people. 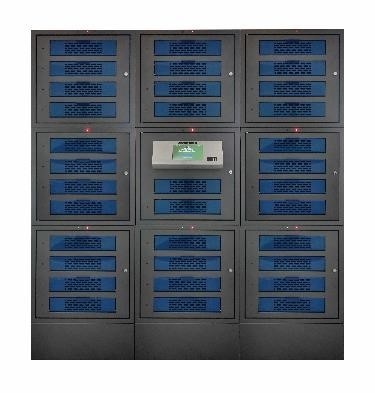 At 2.25” high, 14” wide and 8.5” deep, each locker is sized for small laptops, tablets, phones and other objects; AssetWatcher is available in 10-, 22- or 34-locker configurations. Additional systems can be easily added as needed to expand the solution to support even more lockers. Each assembled AssetWatcher system is designed to be freestanding, wall-mounted, or floor-mounted for convenience and stability.